Our friendly design engineers will help you select the audio/video system to best suit your needs and your budget. If a satellite TV sounds like a high-priced way to receive a television signal, then prepare yourself for a major shock. Safeguard Protection and its sister company, Captive Audio Video has teamed up with the giant in satellite TV, The Dish Network, to bring you quality viewing at very affordable prices. For as low as $149, you can purchase a brand new, state of the art, satellite dish and recceiver to watch on your brand new television. 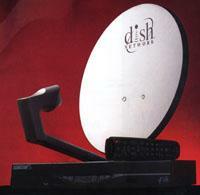 Enjoy a crisper, sharper digital picture and CD quality sound with a Dish system. Images and sound spring to life with exciting realism. For a limited time get twelve months of programming included with your system. "America's Top 40" and "Dish CD." More movies! More Sports! You get so much more with the Dish Network. Why resort to the same, old programs? The Dish Network opens up a whole new world of family entertainment. Complete on-screen program information at the press of a button... easy V-chip child "lock-out" feature for concerned parents... even an on-screen "browse" window! Today, over 3 million homeowners are eliminating the cable companies, with their ever rising costs and lack of service and programming and turning to the future of television. Call your Design Engineer at Safeguard/Captive Audio Video for your information into the purchase of your satellite television. If a satellite TV sounds like a high-priced way to receive a television signal, then prepare yourself for a shock. Safeguard Protection and its sister company, Captive Audio Video, has teamed up with the giant in satellite TV, The Dish Network, to bring you quality viewing at very affordable prices. Copyright 2011 - Safeguard Protection Systems, Inc. - All Rights Reserved.